It always happens: In winter after a few warm days, the daylilies begin to wake up from their slumber—and I begin to worry. “No, no, no!” I say, “It’s too early!” As always, the daylilies (Hemerocallis) know what they’re doing and the new leaves will survive the freezing temperatures that are sure to follow. Undemanding, they return without fail every year, requesting little from us in the process. There are between 14-30 species of daylilies—no one really knows how many. The two species that appeared on the American landscape arrived via the European settlers: Hemerocallis fulva, the orange daylily so prevalent in the wild, and H. flava, the common yellow daylily. As the settlers moved westward, they took daylilies with them. Daylilies are not lilies, despite their name. Dr. Arlow B. Stout, considered the father of modern daylilies, began an extensive hybridization program at the New York Botanical Garden in the 1930s. Throughout his life of hybridizing daylilies, he introduced 100 cultivars that he deemed worthy for the perennial marketplace; today there are over 50,000 cultivars, so truly there is a daylily for everyone. Each year, an established daylily that has already earned the American Hemerocallis Society’s Award of Merit will be awarded the Stout Silver Medal. Daylily aficionados collect these Stout daylilies, which generally are modest in price. While the Stout Silver Medal winners don’t make a lot of money for the growers, there is general recognition that these winners are among the best and the brightest of the daylily crowd. For the gardener, the rewards for growing daylilies are great. They come in a myriad of colors and sizes. There are early blooming daylilies and late blooming daylilies. 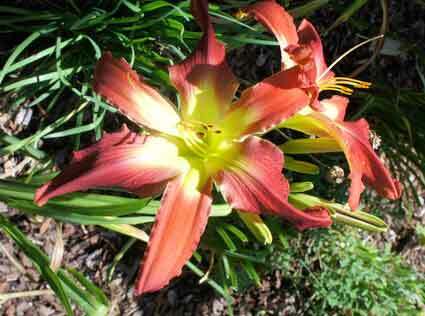 There are two-toned daylilies, ruffled daylilies, and plain daylilies. There are continual blooming daylilies such as the famous ‘Stella d’Oro’, but I would caution you to think beyond these small yellow repeat bloomers—they are too small and inconspicuous. Daylilies need to be noticed. They don’t belong in the back of the perennial border. Give a daylily good sun exposure, a slightly acidic soil—6.5 is ideal— enough water, and a bit of fertilizer at the beginning of the growing season and you’ll end up with a happy daylily. Because their blooms only last for one day, they do require grooming if they are to show off their potential. At the end of their bloom cycle, somewhere in July or August, I cut their foliage in half if it looks bedraggled, give it a touch more fertilizer and within three weeks the new foliage has taken over. Many nurseries, garden centers and individual growers sell daylilies. Don’t be dismayed if the new plant consists of only one or two fans as many daylily cultivars grow quickly once established. I water well during their first year and then pretty much leave then alone except for the daily grooming. Sooner or later the daylily will become so large that division is inevitable. Dig up the daylily using a pitchfork, cut the plant into sections and replant them, giving them lots of water or reward your friends with some. Daylilies have one fault. As with hostas and roses, daylilies are the ultimate deer candy. Daylilies also thrive in pots on a deck—just be sure to give them a daily watering. And, if you can get your hands on ‘Barbara Mitchell’, the 1992 Stout Silver Medal daylily or the gaudily gorgeous ‘Megatron’, give them a special place in the garden or on the deck.